PRESENTING A NEW and SIMPLER MAP! to see the community introductions posted by K-8 classes from across Canada! An artifact entry for that location will open in a white rectangle on the map.. This artifact information box provides information about the class that uploaded the artifacts, and about the artifacts they have uploaded to introduce their community. to see the entire information box. Click on each link to view their photographs. 5. 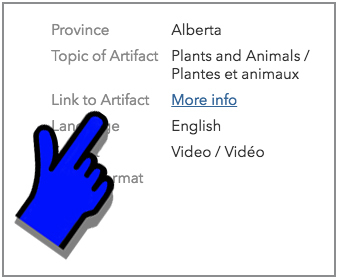 Look at the MIDDLE of the info box for LINKS TO ARTIFACTS. to see any videos, slideshows, websites, etc. posted by the class. to see how many entries are in this location. ( 1 of 2 ) means there are 2 different entries posted at this location. Perhaps one class has uploaded 2 different artifacts, or perhaps 2 different classes at the same school have uploaded artifacts. It might even refer to another school nearby. USE the RIGHT ARROW to click through each different school or class entry. Check out the following videos to learn more about reading the Kids’ Guide map.